While construction of the park was expected to break ground this year, the RFP for the $8 million project was just issued by the Mission Bay Development Group and bids aren’t due until the middle of next month. As such, we’re pushing the projected opening date for Bayfront Park, which is expected to take around 13 months to complete, from the third quarter of 2019 to the first or second quarter of 2020. And once again, that’s not including the park’s future restaurant and restrooms which are expected to take an additional year, at least, to be built. Right now, developers are using this area to store all the construction machinery overnight. It’s hard to imagine them vacating this area and dedicating resources to it during their last push to hit the deadline for the completion of the stadium (end of Q2 2019 I believe). Q2 2020 sounds about right for the completion of this park. Has anyone else noticed how UGHly this thing is turning out? A blight upon the neighborhood. Too bad they didn’t collaborate with the Giants on a building at Lot A for a building themed to its location and a mixed-use development on the Salesforce site. You mean the park or the stadium? A new waterfront park is certainly not a blight, and in Mission Bay let’s be honest, the relative standards for “blight” were a lot worse even 5 years ago. Surprisingly all of the homeless are in SOMA or Portrero Hill, and not in mission bay. I guess the private security force funded by Mello Roos keeps them out. Oh yeah, because run down warehouses and so much rust that tetanus was basically airborne were truly the hallmarks of an unblighted neighborhood. The thing is godawful. Build a box around it and hang some decent faux facade off it. Would actually be an improvement. Yep you’re right. It’s infinitely worse than the destitute hellscape that was there before it. Get real dude. And you literally advocated for building it just a few blocks up and putting more modern cookie-cutter boxes at the current arena site. Pretty damning proof that you don’t care about the design at all and just want a (very slightly) different location. Much of it should be hidden by the office buildings going up adjacent on 3rd. And that’s a good thing. Except that the buildings themselves are so banal they “complement” the arena. And whatever happened to the construction schedule for Crane Cove Park? Prep. work was done in 2017 and the it stopped…with construction to have proceeded in 2018. The Port has not moved ahead in over a year! As I understand it, the schedule projected in the linked item was sidetracked by bids which came in much higher than anticipated. A scheme to rework the RFP by eliminating some big ticket items such as the restoration of the crane cabs (for which separate funding was to be secured and put out for independent bidding) was to have resulted in contracts being made allowing for the start of actual construction by now. The fact it hasn’t happened leads me to believe that even the pared-down features again came in too high. I would greatly appreciate a more authoritative update. Hang in there – it took years (like 10+) to get the Brannan Street Wharf park constructed even with the $20M+ ready to go. But once done the ‘hood had a great new place to place to walk dogs. The BSW is also a favorite spot for homeless camps. Things have gone downhill since it opened, but maybe that is a citywide observation. My 2 cents is that it’s an impressive improvement. It’s helped fill in the gaps between the first buildings built. It’s also much better than the buildings that have been built to date IMHO. I think the scale actually fits the neighborhood, unlike those god awful concrete arenas that seem to dot every university town. 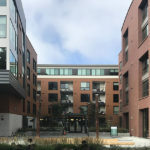 I’ve been running from downtown to dog patch for more than 10 years, and it’s finally feeling like a neighborhood, and that’s a good thing regardless if you want a modern space ship, subtle box or decorated cake building. The Uber HQ buildings (if that’s what they ultimately become) are going to provide a fine streetwall along the east side of 3rd St. (Wilie Brown Blvd). That horrific Chase mishmash not so much. So literal glass boxes that come almost right up to the street are fine but a metal and glass-clad round arena that is set back from the street is an eyesore? Must take a lot of effort to have such abjectly terrible takes. I wouldn’t expect an admirer of exurban schlock to appreciate an urbane streetwall setting a sense of place the way the Uber buildings frame the view of the distant Downtown towers. I’m sorry you seem to have to be so protective of this asset, but it has been horribly executed. Should have been a very different building in Downtown Oakland near BART anyway. Ah, what foolishness. Big SF booster here. Probably why I’m so disappointed at what a mess this has turned out to be. I abashedly admit down deep I’m glad we stole (back) the NBA franchise and all that comes with it. However, from a broader and wiser regional planning viewpoint, there’s no doubt the Warriors should have built their new facility in Downtown Oakland. I’m amazed at how unattractive this structure is turning out to be. Even Oracle arena with its glass facade and interesting cross beams has more architectural flair. I agree that placing a architecturally pleasing arena in downtown Oakland would have been far better for our region. Having said that, i’m glad this particular structure is not in Oakland. Representing your subjective aesthetic tastes as fact isn’t doing you any favors. And it sure doesn’t help your case that you already admitted in this thread that to you it’s a location issue rather than a design issue. Do you really think I would want this architectural atrocity on Lot A? I wouldn’t want to see it built on a San Leandro mall parking lot much less across from China Basin Ballpark. My greatest disappointment is with its design but I reiterate that the Warriors and Giants should have collaborated to place a smartly designed new arena with entrance off Channel Street and the “Mission Rock” neighborhood on the property GSW purchased from Salesforce. So porta potties in the meantime? Or the City’s usual plan – no public services provided in a large park with nothing in walking distance? Would’ve been nice to have the Bayfront Park open simultaneously as the beautiful, awesome, long-overdue arena, but hey, I understand that couldn’t reasonably happen.